Hi Everyone! My name is Maggie May, but I guess you already know that. My Mommy has probably bragged a lot about me, since I'm so cute and sweet. If she has ever told you anything about me getting in trouble or being what she calls 'rotten', well, she's crazy. She gets that way sometimes. Anyway, Mommy is busy eating something she calls a Whopper. Gosh, she gets so excited about those things. She never even shares any Whopper parts with us! No fair! So, while Mommy is busy, I'm going to show you some of my favorite photos that Mommy took yesterday. Of course, they aren't going to be as pretty or as cute as this photo of me, but they're OK photos anyway. 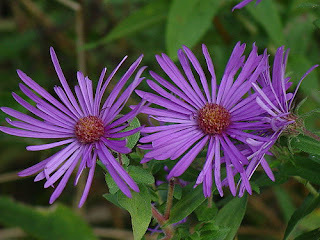 This is a flower called Aster. At least that's what one of Mommy's Flickr friends told her. 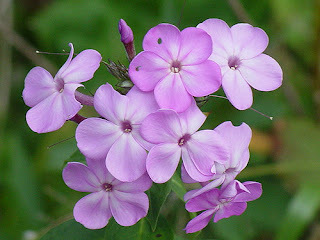 Mommy LOVES this flower because it is purple. Mommy LOVES purple A LOT. She loves purple so much that as soon as I moved in, she went and bought me a purple collar right away. It's really purty. Then, her BFF that she calls her Partner-in-crime, went and got me a purple leash to match! I'm not spoiled, I deserve all of the attention and love that I get! 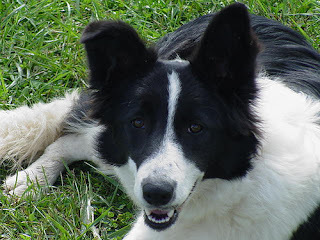 Besides, have you looked at Mommy's photo on her blog banner and seen how very cute I was when I joined the family? Of course I deserved some extra special attention - how could they resist? 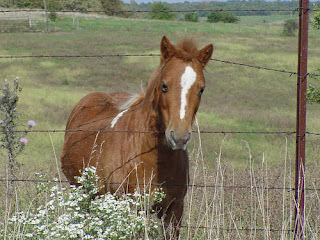 This is a little miniature horse that Mommy saw during her drive. They didn't even take me or Molly or Tag with them! I'm not jealous that Mommy was petting this little horsee on the nose, because I'm very comfortable with the fact that I'm absolutely adorable and Mommy could never choose anything over me. If I would have been there, I would have told this horsee that that fence stuff hurts when you rub on it. Silly horsee, I bet he was sorry! Whoa - look at this guy! Look at them horns! I would love to run circles around that cow and tell it which way it should go. I'm really interested in learning to herd or do agility. Mommy is going to teach me that stuff eventually. 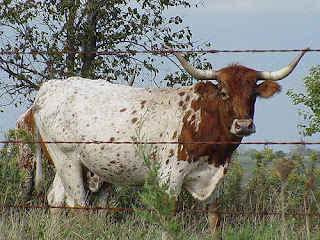 In the meantime, just look at those horns!!! Another very purty flower shot. Mommy likes to take photos of purty flowers. Bye everyone! It was great barking at you. Oh, and if you noticed, yes, I am very good at spelling and stuff, cuz Molly taught me. Molly teaches me everything - she's real smart! Hi Maggie! You're getting so big! You take beautiful pictures! I have some of the flowers in the last picture in my garden. I always called them flocks, but I don't think that's the right name. I'll have to dig out my flower book and look them up. I don't like letting my teenager use my computer let alone my dog. LOL. Just kidding, I like her post!!! what wonderful pictures!! You do such nice work!